Love these Winter Phrased Hoodies | 4 Phrases $19.99 (Retail $29.95). Winter is here! 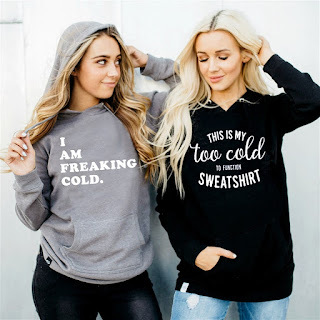 Be prepared with one of these cozy sweatshirts with a phrase that states your dislike of the cold! Long sleeve v-neck hoodie with kangaroo pocket and printed with winter phrased graphic on front. Care Instructions: Machine wash cold, dry flat.